The Simpson Strong-Tie Strong Frame Design Guide is intended to help Designers and Specifiers understand the Strong Frame design process, the important considerations and the services that Simpson Strong-Tie provides. It also provides Installers with an overview of the ordering process. The Design Guide comprises eight main sections, which you can explore below. A brief overview of steel moment frame design requirements. Simpson Strong-Tie Strong Frame moment frames are the most efficient and cost-effective on the market, precision engineered for Designers, Installers and Building Owners alike. Frame opening measurement; installed costs; ordering and lead time; special inspections; and what is included with a Strong Frame order. 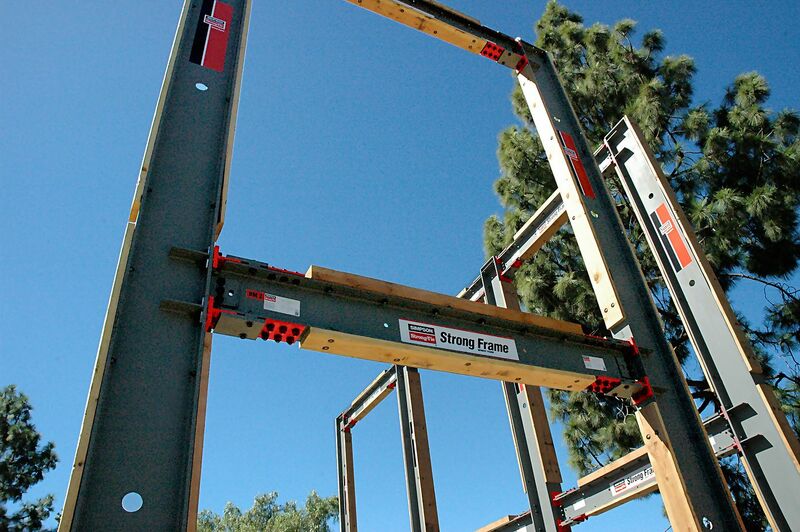 Strong Frame moment frames are designed for fast and easy installation. Our simple, streamlined dimension verification and ordering process keep your job moving ahead. Offerings, design requirements and options. Simpson Strong-Tie Strong Frame special moment frames provide optimal moment transfer solutions for both new and retrofit projects. Our Yield-Link® structural fuse technology ensures the resilience of the frame during seismic events. The methods of specifying a Simpson Strong-Tie Strong Frame. The Strong Frame moment frame selector software helps you specify a moment frame to meet your project’s geometry and load requirements. Or let Simpson Strong-Tie Engineering Services design a solution based on your exact criteria. Strong Frame anchorage designs and products. Simpson Strong-Tie offers moment frame anchorage options to fit your job design. Preassembled anchor bolt templates make for quick installation. A checklist of the possible connections to the Strong Frame steel elements. Connect your structure to Strong Frame steel moment frames in a number of different ways to suit the specific needs of your project. A vast array of resources to assist designers and contractors with specifying and installing Strong Frame moment frames in projects. Our abundance of online resources — software tools, load and installation sheets, videos, code reports and drawings — are available to help you select or design the ideal moment frame. Simpson Strong-Tie is phasing out the Strong-Frame® ordinary moment frame (OMF). After December 31, 2018, we will only accept Strong-Frame special moment frame (SMF) orders. All existing orders OMF will be honored and filled through June 30, 2019, as long as inventory is available. Please click here for information and design assistance with our special moment frame (SMF) product line. Simpson Strong-Tie Strong Frame Moment Frame Selector software helps the Designer select the appropriate frame based on your project's given geometry and loading. Send us your completed worksheets and we'll evaluate the frame you have chosen and provide a response within 2 working days. More information about calculating load capacities and code reports for the Strong Frame Moment Frame is available in Strong Frame Technical Notes.